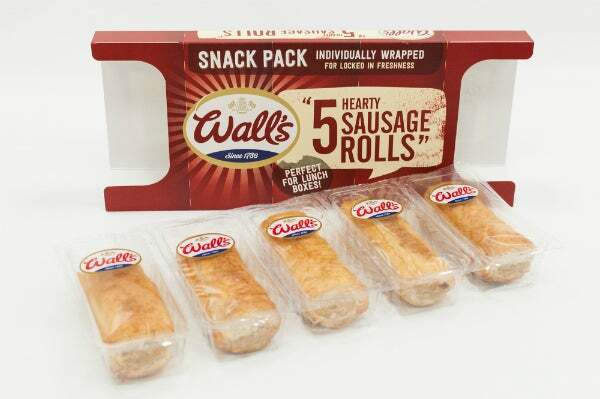 The multi-cavity pack taps into the on-the-go snacking market, offering the option to snap off one of five individually wrapped trays as required, whilst keeping the remaining sausage rolls sealed for later. The innovative pack design, described as ‘perfect for lunch boxes’, gives the consumer the ability to exercise portion control, which keeps the PP tray contents fresher for longer and ultimately results in less food waste. The cardboard outer, designed to show the tray contents, provides maximum shelf-appeal to retailers. Parkside’s unique printed lidded film was key to the design of the first-to-market pack. The film, which features an integral waved perforation pattern created by the company’s specialist multi-directional laser technology, ensures a consistent and clean snap when breaking away the trays. The PET heat-seal lidding film can be applied to all tray materials giving the option to utilise the packaging technology on further products in the Walls range. In the case of the Walls snack pack it met consumer demand for a tear off lunchbox pack, which was identified in market research conducted by Addo Foods Group. Pete Ford, new business manager at Parkside, said: "Pork Farms were supportive of the innovation process for fulfilling this challenging snap-pack brief. The benefits of the resulting pack will be seen throughout the supply chain; it sets Walls apart as an innovator, has great shelf appeal for the retailer and offers many USPs to the consumer in terms of portion control and food waste reduction." "The easy-snap process, made possible by the integral perforation in the heat-sealed lidding, is completely new to this market sector. The actual functionality of the packs when used is superb and very satisfying when snapped. In terms of convenience and functionality, it achieves all that we set out to do." Parkside’s collaboration with Pork Farms on the development of the Walls snack pack was the result of a recommendation from leading tray sealing machinery manufacturer, Packaging Automation. The three parties successfully worked together to develop the innovative concept in answer to the need for an individual snack pack for the on-the-go food market.